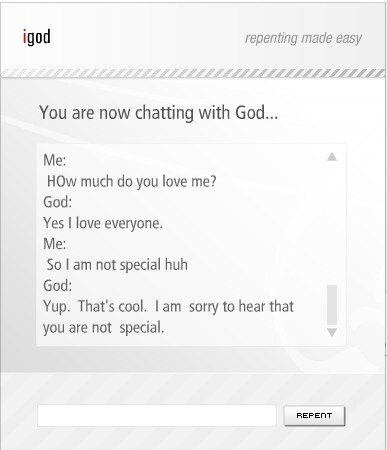 Chanced upon this online igod thingy where one gets to talk to “God” via MSN chat. Check out “God’s” answer when you type: Are you a male or female? weird things pple come up wif..
God answers. See Psalm 139. I am wonderfully and fearfully made. I am beautiful. He knows when I sit and when I rise. In Science (for pseudo-science people), of billions of people in the world, there is NO ONE OTHER with my fingerprint, iris, DNA, unique personality !! Out of billions of people! Imagine that. NO ONE ELSE. God is so interested in me and not in creating identical robots. Its up and working… Btw, you can actually talk to God without this site. Just talk. He answers.